This Fox Labs pepper spray foam comes out like shaving cream and adheres to the face of your target. It sticks there and burns like crazy. It will block their view if wearing glasses or goggles, making them remove them thereby exposing their eyes. Your aim with Fox Labs Foam pepper Spray has to be a little better than using the fog, but it really stays put and is less likely to blow back on you in windy conditions. It is also less likely to cause cross-contamination indoors due to its focused output. Note: This Fox formula is 2 MM SHU due to differences in the foam manufacturing process. It is the only foam product Fox Labs makes comprised of the original 5% formula using 2 million SHU OC. 1.7 oz. We cannot ship pepper spray to NY, AK or HI. 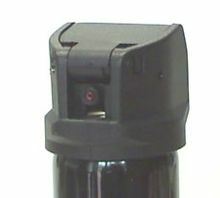 Pepper spray and aerosol products cannot be shipped by air. Expedited service is not allowed.